There are some plants I wouldn’t like to be without in my garden and this is one of them. 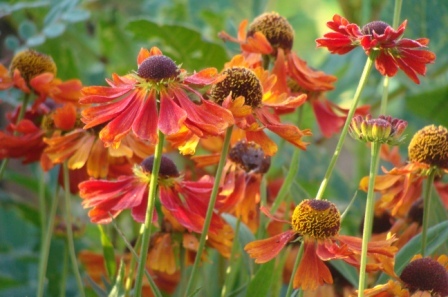 I love orange flowers… in fact I love everything about Heleniums. In bud they have just a hint of what’s to come. Then the petals unfurl and the huge central disk expands and attracts bees galore. It’s September and already the garden is becoming a much more mellow place. Heleniums flower from June until the first frosts and this variety ‘Moerheim Beauty’ is perfect for adding colour to your country garden. 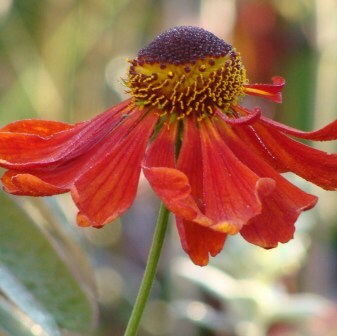 Helenium Moerheim Beauty is an excellent hardy perennial reaching 120cm when mature. It will flower from June until the first frosts in October if regularly dead headed. The daisy like flowers are a rusty orangey deep red colour with a dark brown eye. They are very attractive to bees and other beneficial insects but watch out for slugs as they like them too! Needs a sunny position and staking for support. Tidy away the old stems and foliage after flowering to prevent slug attacks and allow the new green shoots access to plenty of sunlight and air over winter.